Congratulations! 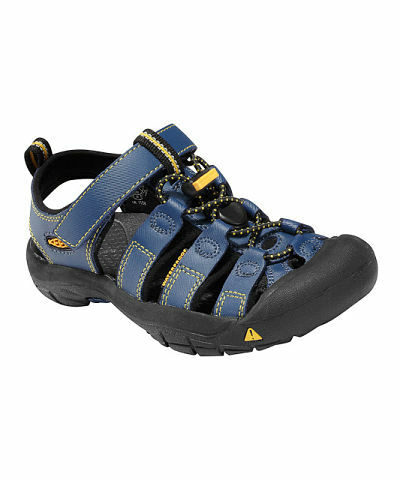 You have decided to ditch your flip-flops in favor of something a little more substantial. Boat shoes, deck shoes, topsiders — whatever you choose to call them — are the hallmark of any experienced sailor, and the preferred footwear of seafaring preppies worldwide. Nothing says "get the launch, Winthrop," like a gin and tonic and a weathered pair of Sperry Top-Siders. Fashioned after the low-cut moccasins that the Native Americans wore, leather boat shoes offer protection from the elements, protect your toes, and provide traction on a boat's slippery surfaces while repelling water and cushioning your feet. Here are more important factors to consider when selecting boating footwear. What type of boating or sailing you will be doing? Do they support and protect your feet? Do they provide good deck traction? Will they keep your feet warm or cool? Boat shoes may be sized differently than street shoes, and they can be made of leather, canvas, suede, or synthetic material. So pick a shop where an experienced sales associate can help you find the right fit. Check for quality and comfort. If you prefer shoes that slip on and off easily, look at footwear without laces, sometimes called “Reef Runners.” Make sure the slip-ons fit snuggly. In the case of boating footwear, price can indicate better quality. Until you have enough experience to have a footwear opinion, go with the good stuff. In life, it is good to have a strong and steadfast soul, but even more so for your boat shoes to have them! Good rubber soles help keep you from sliding around on rolling, slippery decks. “Siping” is a classic, wave-like pattern of grooves impressed into the rubber sole that grips the boat deck and pushes water out. The design was developed by Paul Sperry in 1935. Sperry copied the wave-like grooves from a dog's paw to create a rubber outsole that would give sailors traction on wet decks. Some shoes offer a variation of this design and feature molded siping, a pattern of raised rubber mounds and grooves that drain water. When comparing shoe styles, ask the salesperson about the rubber used in each pair. Some rubber compounds are “stickier” than others (“gum” soles) and will provide better traction. Always make sure that the sole is “non-scuffing,” meaning that the shoe leaves no marks on the boat deck. In addition to sturdy soles, boat shoes should have water “wicking” uppers to keep the shoe's footbed as dry as possible. Many people prefer leather uppers, though they are not as quick drying as synthetic materials. Quality deck shoes should have a padded cushioned tongue and insole to keep your feet comfortable. Look for removable insoles that allow the shoes to dry faster when taken out. A soft leather insole will likely provide more comfort, while a mesh insole may allow for better draining. Some shoes also come with drainage holes built in. Check for good reinforcement at points where wear-and-tear will be greatest, like the heel. This will tell you that the shoes are more durable and will last longer. Many people opt for leather shoes because they can be worn both on and off the boat. Leather shoes have been treated with water repellant to reduce moisture absorption and may dry faster. Polish and treat them on occasion to maximize their life span. Here's a quick primer on how to keep leather boat shoes looking good and functioning well for the long haul. Step 1: Before applying products to your shoes, take the laces out to keep them from fraying. Next, wipe them off with a soft cloth or sponge dipped in water, polishing areas where dirt and debris may be stuck. Pay particular attention to the seam between the shoe and sole. Step 2: Using a soft cloth, apply saddle soap to the shoes, rubbing it in thoroughly. If the shoes are not clean after one application, repeat the process. Step 3: Apply a thicker application of saddle soap to any areas of the shoe that are still discolored. Let the soap sit for about 30 minutes before buffing it clean with a dry cloth. Make sure to remove all excess saddle soap using the cloth. Step 4: When the shoes are dry, wet another cloth with mink oil and rub it into the leather. Allow the leather to soak up the oil before wiping away any excess. Note: If you are short on time, you can also use a washing machine. Take the insoles out of the shoes (if they are removable) and put them in a pillowcase along with the shoes. Knot it up and toss it in the washing machine with a little detergent on a long, cool cycle. When the shoes are clean, stuff them with newspaper or paper towels to help them keep their shape while they air-dry. Never put leather shoes in the dryer. 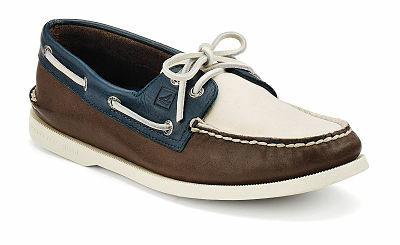 Traditional topsiders are great, but there are many choices for boating footwear. Keeping in mind your particular boating activities, you might choose quality sandals pictures at right. With such sandals, toes are protected, they are cooler than leather shoes, drain easily, and the heel strap prevents "flip flopping." For more aggressive sailing and racing, Helly Hansen racing shoes are a good choice. Very light, non-scuffing soles, and their ability to drain water quickly make it a good contender for your boat shoe purchase.